I have a confession to make. Two years ago at New York Comic-Con, I picked up a bunch of Valiant trade volumes with the intention of getting caught up with the publisher’s rapidly expanding universe of heroes and villains. Immediately, I blew through and loved both The Death-Defying Dr. Mirage and Harbinger Volume 1: Omega Rising, but just as I was about to dig into Divinity, I lost my momentum. Divinity’s story of how a Cold War-era, black, Russian cosmonaut travels into space and is imbued with godlike powers fascinated me in theory, but I’d begun to feel the early symptoms of comics fatigue—that feeling you get when you try to consume too much of a narrative universe without giving it time to settle. I wanted to get lost in Valiant’s rebooted world of gods and monsters, but, as a newcomer to the publisher, it was difficult to really feel rooted in Valiant’s universe in a way that continued to its other books. So, for a long while, I moved Valiant’s catalog to the “will read” pile as opposed to the “reading this week” pile. But then, earlier this year I started reading Daniel Kibblesmith, Derek Charm, and David Baron’s Valiant High, a monthly, digital-only series that took teenaged versions of Valiant’s most recognizable characters and dropped them all into high school together. The limited series is coming to an endthis week with its fourth issue available on Comixology and, having read it, it’s sold me on Valiant entirely. 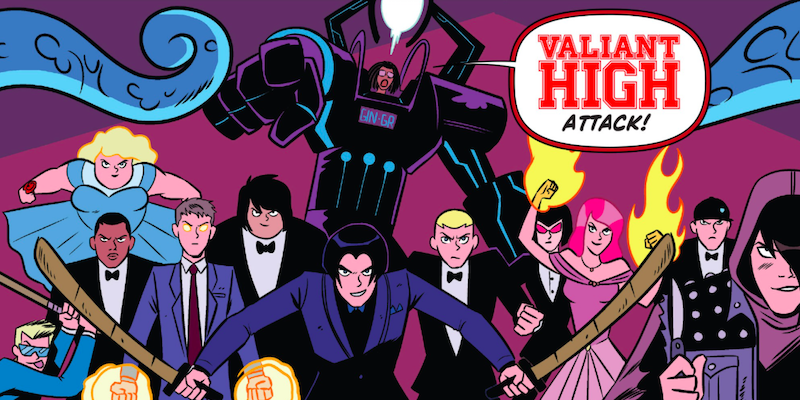 In an age where most major comics publishers use sprawling events and reboots like Secret Empire or Rebirth to lure in new readers, Valiant High stands out because of how utterly fun and action-packed it manages to be while also being relatively low-stakes, story-wise. Where Marvel and DC use the apocalypse as a reason to get all of its heavy hitters in a room together to interact, Valiant chose to focus on something much more relatable and eternally present: teenage anxiety. Characters like Faith, Livewire, and Archer & Armstrong are all still their recognizable selves in Valiant High, but Kibblesmith’s approach to distilling their adult complexities into more intense, concentrated teen selves made them pop in a way that, for me as a relative newbie to Valiant, was perfect. Even though I hadn’t spent dozens of issues getting to know these kids and their quirks, they felt familiar in that same way a new, enthusiastic friend does when you first meet them. While there’s an overarching subplot about the book’s character discovering the secret their domineering principal (Harada, of course) is hiding, Valiant High’s ultimately about friendship and, to a lesser extent, introducing you to everyone. While all of Valiant High takes place in a pocket dimension outside of the publisher’s main continuity, it’s the perfect kind of group event that both familiarizes you with nearly all of its characters and encourages you to branch off to read those characters’ solo books. Put simply, this is how you do an event that’s meant grab up new readers. Start with something fun and light and then encourage them into the deeper, more complex (but hopefully Nazi-free) waters at the other end of the pool. I sincerely hope that Valiant High gets a follow-up that sees the school’s graduates going on to college or taking up hero work, but even it doesn’t, that’s fine. Because Valiant High was the ideal kind of story that drew me in, made me genuinely like its characters, and then ended on a lovely high note. Most importantly, it made me want to check out Valiant’s “main” comics again. And isn’t that the point?